In E-commerce business, cart abandonment is considered to be the bad sign, where your potential customers start checkout process and leaves without completing the transaction. This remains the biggest question mark for most E-commerce store owners. We at CustomerLabs got you a solution to track shopping cart abandonment the easy way. Increased price at the checkout is considered to be the most important reason where people leave without completing the payment process. It is advisable to show the full price of their order including shipping before they add items into the cart. Offer as many payment options as possible and include local payment methods. Tip- Display items in local currency. It is no wonder that people don’t complete checkout process if they don’t trust your payment page of your website, security icon makes your customers feel better and adds trustworthiness to your store. Adding your company address and telephone number increases the trust. Tip- Add Trusted stores program offered by Google. It is always advisable to add a clear written policies for all products that you offer on your E-commerce store. This makes your customers feel confident in their purchase. Offering free returns will appeal more online shoppers. Tip- Make sure to include Return policies at payment page as well. Adding optional signup option on your E-commerce store is always advisable. Usually, people feel discomfort if the registration process is too big. Offering customers a social login is a great option where your customers don’t have to spend a lot of time. Tip- Offer a guest checkout option. It is no doubt that E-commerce stores with no proper design lose its customers. Chances are that people will never return back if your website doesn’t provide clear guidance, especially for first timers. Good responsive design and clear call-to-action is the first impression for a visitor. Optimizing your website for mobile is essential. 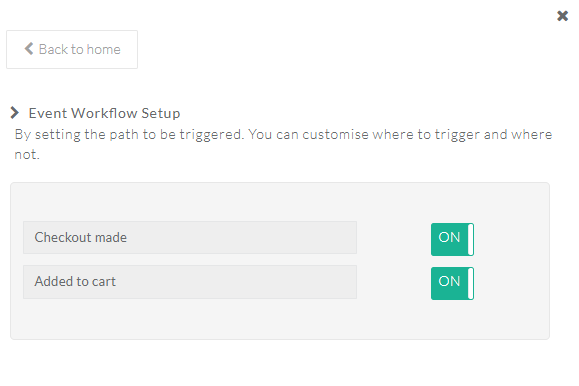 Tip- Great design with easy navigation. Lack of product information on your E-commerce store may lead customers to leave your website. Including all necessary details of the product always helps the shoppers to get a better overview of the product and displaying the previous review of the product helps customers to take better decision. Tip- Clear product information. Offering a great customer support is always essential. 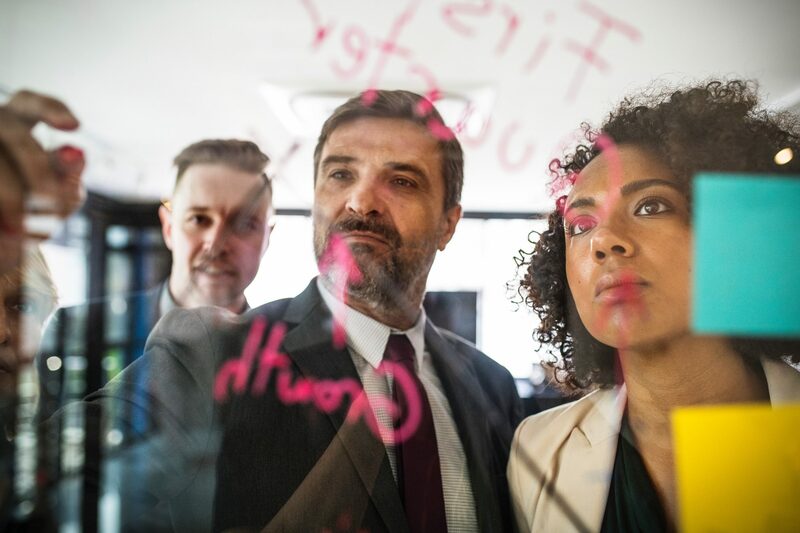 Your customers can face issues or problems at any time, guiding them to the forums or replying them with the great solution makes them feel comfortable. The chat box is a great feature that makes customer interaction better. Tip- Include messaging bot to deliver an instant replay. Long and complicated checkout process cause 27% of cart abandonment in the US alone. 25% shoppers face price increment at checkout. 73% of online shoppers prefer free shipping. 35% of shoppers don’t want to create an account. Shipping cost may lead to 66% of cart abandonment. No proper shipping information causes 22% of online shoppers to leave. 36% prefer price match guarantee. 41% of shoppers are not ready to make a purchase. 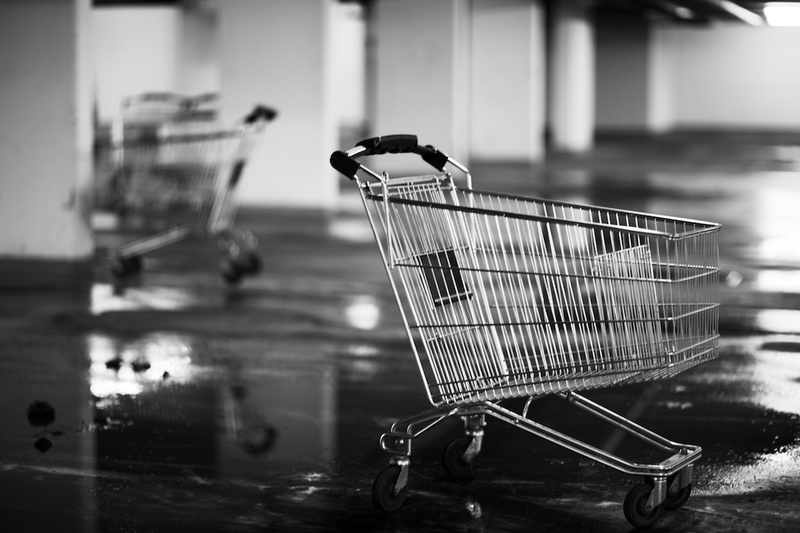 Cart abandonment is one of the biggest problems most E-commerce store owners face. With that being said, tracking cart abandonment events in your store is an absolute must. However there are many software and tools available in the market, Most require you to have some coding knowledge to use. Here is where the Action Recorder by CustomerLabs come fits in. This helps you set up event tracking for your E-Commerce store and integrating it with GA and Facebook helps you to send targeted ads directly to your website visitors. Seriously no coding knowledge required to use this. Setting up remarketing campaigns in GA and Facebook helps you to track and send ads to people who shown interest in your products and abandoned cart without making a purchase. Setting up remarketing campaigns in GA and Facebook helps you to track and send ads to people who shown interest in your products and abandoned cart without making a purchase. Follow this simple step-by-step guide to track checkouts made on your store using Action Recorder (Action Recorder lets you to set-up event tracking without knowing a single piece of code) and send data to Google Analytics and Facebook with just click of a button. By this way, you can track your website events on Google Analytics and Facebook and setup retargeting ads to your visitors who have abandoned cart. Setting up an account with Action Recorder takes no more than a minute. The next step is to get a tracking code. The unique code gets displayed on clicking tracking code. Go to Edit HTML/CSS of your E-commerce store and insert this small piece of JS under the <head tag> of your E-commerce store. This should look something like this. Enter your store URL in Action recorder and click on verify code. The following message is displayed once your code is verified. Get ready to record your Actions. Choose action name as “ADD TO CART” to track Add to cart events in your store. Click on pointing symbol, select “Add to cart”, as it is done below. The next step is to choose attributes. The attributes are the information displayed with the product when someone clicks on the event which you set for tracking (It simply describes more about your product). For this below example, I need product name and price to be displayed as the attributes. To set product name as the attribute, select attribute as product name and click on pointing symbol manually. Select Product name, as it is done below. Click on save, Once you are done. To set product price as the attribute, select attribute as product price and click on pointing symbol manually and select the product price, as it is shown below. On clicking save, your attributes will be displayed towards the right of your screen. For “Add to Cart” event, I would like to track all products in my store. This helps me to get the name and price of the specific product that has been added to cart. Click on save action, once you are done. Your “Add to Cart” event is now set with Action recorder. Choose action name as “CHECKOUT” to track checkout made events in your store. Click on pointing symbol manually and select “Checkout”, as it is done below. For this example, I want product name to be displayed as the attributes. Click on pointing symbol manually and select product name as it is done below. On Clicking save, your attributes will be displayed towards the right of your screen. For “Checkout made” event, I would like to track all products in my store. This helps me to get the name of the specific product that has been sent to Checkout. Click on save action, once you are done. Your “Checkout made” event is now set with Action recorder. 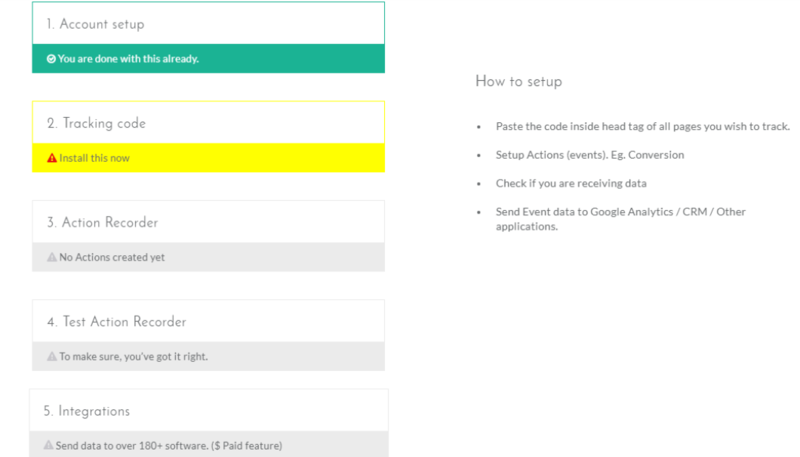 Once you set Add to Cart and Checkout made events for tracking. Now, It’s time to test your Action Recorder. Open your E-commerce store in a new window and click on Add to cart and checkout made events. Click on“Add to Cart” event on any of your products in your E-commerce store. If your desired tracking is on all products. In Action Recorder click on test for “Add to Cart” action. 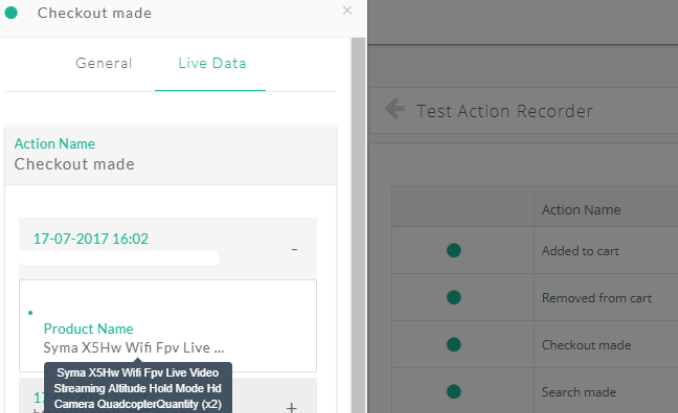 On clicking live data, the product details get displayed with its attributes. Click on “Checkout made” event on any of your products in your E-commerce store. If your desired tracking is on all products. In Action Recorder click on test for “Checkout made” action. 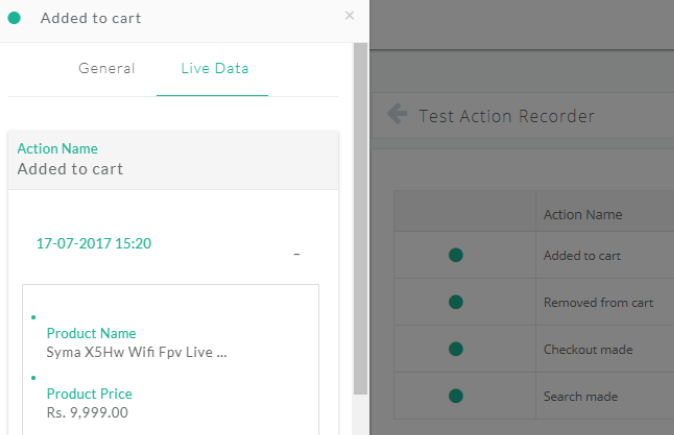 On clicking live data, the product details get displayed with its attributes. 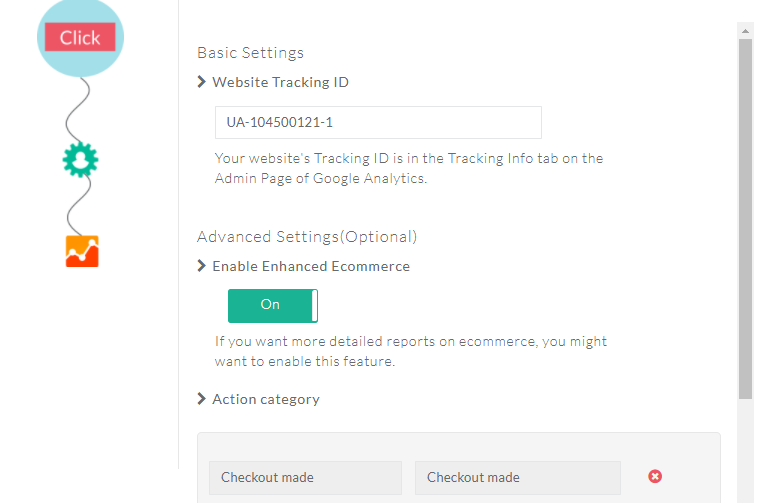 To integrate your E-commerce store with Google Analytics, you need to add Google Analytics tracking code. 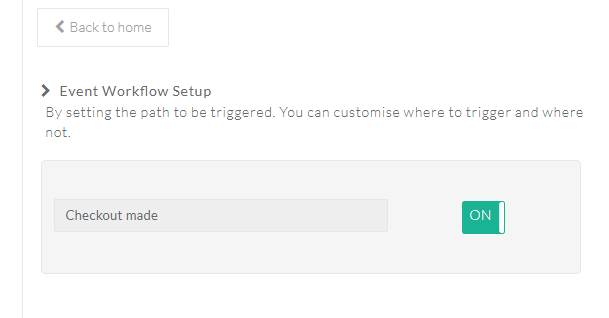 Go to settings in admin panel→ Tracking info→ Tracking code, your tracking ID gets displayed here. 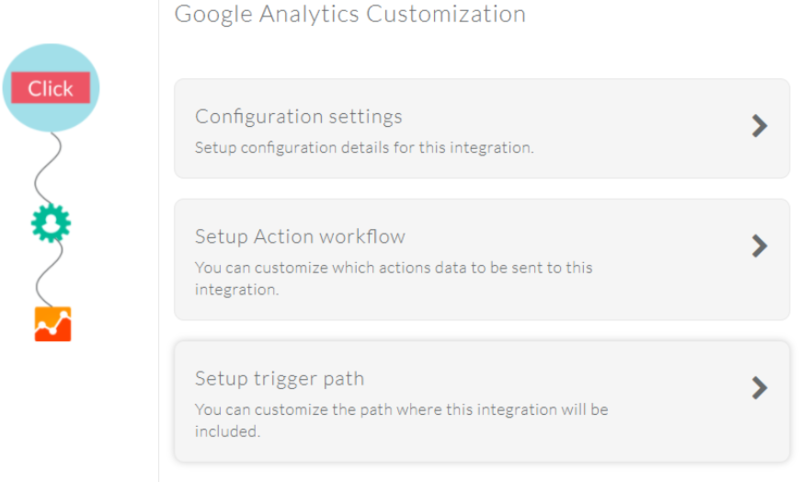 To customize Google Analytics with Action Recorder, follow these steps. Configuration settings: a.Paste your Google Analytics tracking ID b.Enable enhanced E-commerce for Google Analytics c.Set your action category as Checkout made On setting Checkout made as event workflow, It sends checkout data of your store to Google Analytics. You can create Google Adwords remarketing audience with custom segments feature in Google analytics. Firstly, connect your Google Analytics account to your Google Adwords account. In order to do this go to the admin section of GA under product linking tab click on Adwords linking—> Tracking info—> Data collection–> Turn on the Remarketing and advertising and reporting features Now, you are ready to setup custom audience via custom segments. To build custom audience, Go to segments in Admin panel—> Personal tool & assets—> Add new segments—> Conditions To build a custom audience who have abandoned cart you E-commerce store, you need to set a list for people who have added products to cart and didn’t complete the transaction process. Give a name for your audience and click on save. Next, you need to link your audience to Google Adwords. 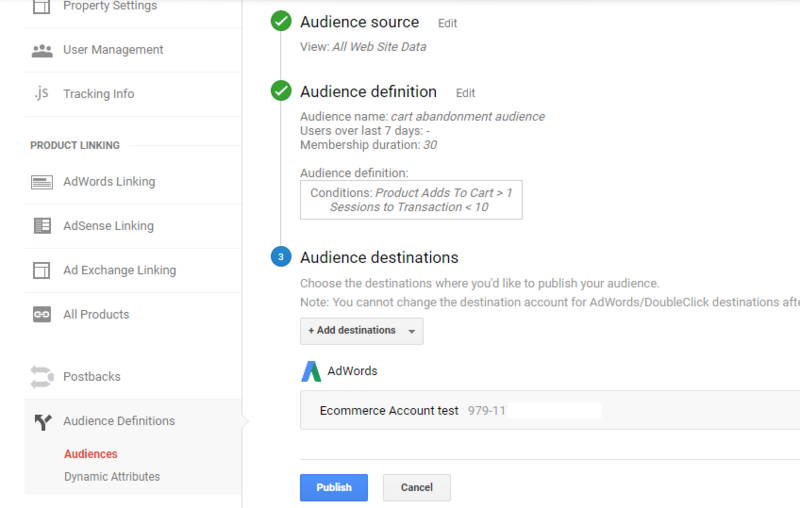 In order to do this go to product linking in Admin panel–>Audience definition–>Select audience which you chose previously Select Adwords as the audience destination and click on publish once you are done. You can find your audience in your Google Adwords by selecting shared library—> audience–> your audience gets displayed here. By this way, you can send retargeting ads using Google Adwords to people who have abandoned cart on your store. Well, that’s it! Your E-commerce store with Google Analytics integration is all set now, you are ready to send Checkout made events to Google Analytics. This helps you to track cart abandonment in GA. By sending data to Google Adwords you can retarget your visitors by sending targeted ads. To integrate your E-commerce store with Facebook, you need to add a Facebook pixel ID. Go to Facebook Pixel Tab in your Ads Manager→ Click Create Pixel→ Name your Pixel→ Create pixel. 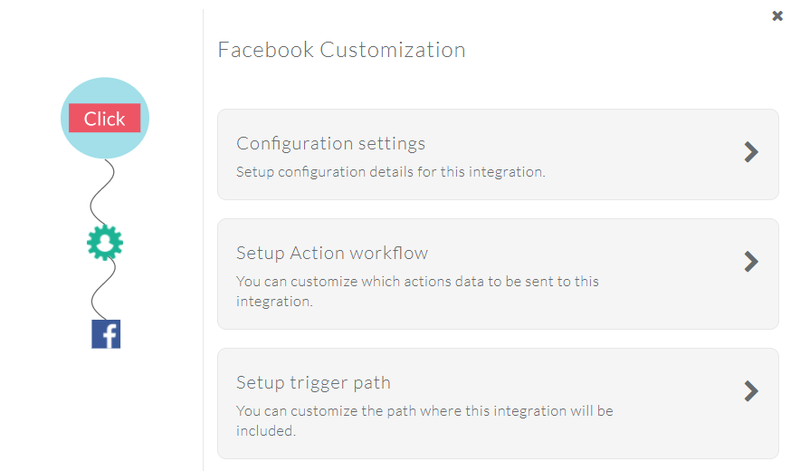 To customize Facebook with Action Recorder, Follow these steps. Configuration settings: Paste your Facebook pixel ID. On selecting Add to Cart and Checkout made as event workflow, It sends checkout data of your store to Facebook. 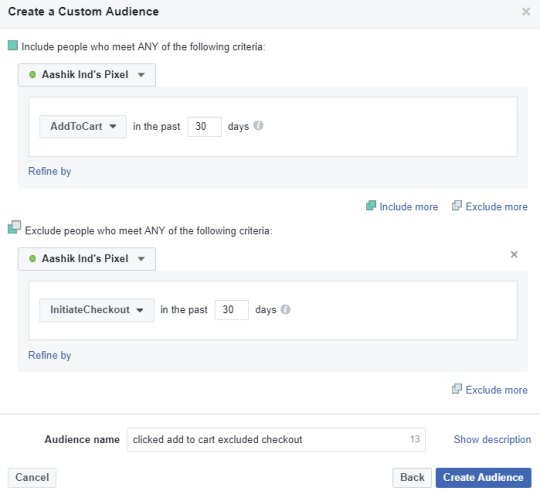 To create custom audiences, Go to Facebook Ads manager→Tools→Custom Audiences→website traffic. To create cart abandonment campaign, Include Add to Cart option and exclude Checkout. Give a name for your audience and click on Create Audience. By this way, you will receive the data of people who have added products to the cart on your E-commerce store and abandoned before the making the checkout. This data helps you to hyper-target your audience by sending them abandoned cart remarketing ads. Well, that’s it! Your E-commerce store with Facebook integration is all set now, you are ready to send checkout made events to Facebook. This helps you to track Cart abandonment. By setting up a custom audience you can send targeted ads to visitors abandoned cart on your E-commerce store. What do you think…? Was it easy…? Action Recorder is specially made for Digital marketers like you, To increase your productivity. Learn to set E-commerce event tracking for your entire store using Action Recorder. To set cart abandonment campaigns in drip visit Blog Please recommend us… Try Action Recorder, if you need any help do let me know. Happy to help you.